Styles in Firemonkey are still a bit of a challenger to wrap your head around. If you need to customize a TEdit so the height it not fixed, make the TEdit background transparent, or just learn more about how styles work in Delphi XE6 Firemonkey you’ll want to keep reading. 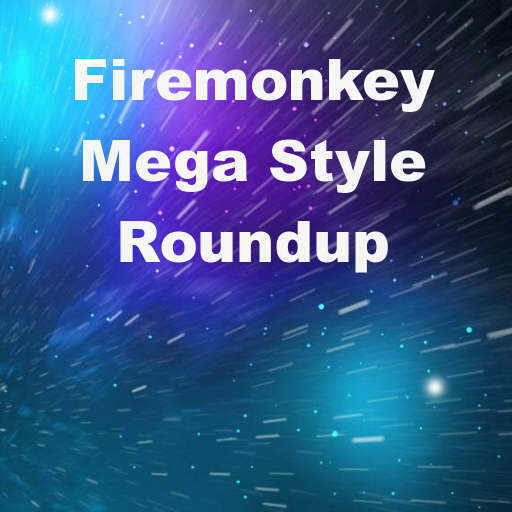 First up we have a post from a couple years ago by Mike Sutton with 10 tips and tricks you’ll want to know about how styles work in Firemonkey. The post was for a previous version of Firemonkey but I’ve read over the list of 10 and they generally all still apply. Head over and check out 10 things every Firemonkey developer should know about styles. Next there is a Stackoverflow question and answer about customizing a TEdit so that the background is transparent and has no border. One caveat about the instructions is that on a mobile form the Edit Custom Style right click menu option is not available. You can get around this by creating your custom style in a desktop Firemonkey Form and then cutting and pasting the resulting TEdit and TStyleBook into your mobile Firemonkey Form. Be sure to set the StyleBook property of your form to the StyleBook component you paste in from the desktop Form. Head over and get the instructions for creating a custom borderless transparent TEdit style. Next up in a similar custom style question and answer on Stackoverflow it is explained how to remove the height restriction that TEdit has. Apparently there is a FixedHeight property set in the style on a TEdit and if you remove that property from the style you can change the size freely. You may need to employ the same cut and paste method from a desktop Firemonkey Form to implement this as well. It does mention that this applies to the MetropolisUI style. Head over and check out the full question and answer for removing the fixed height style on a TEdit. Lastly, David I. from Embarcadero has an hour long session (part of their Developer Direct 2014 Mobile School) that talks all about styles, what you can do with them, and how you can customize them. There is so much information about styles in here you may want to pause on some of the slides and study them because a lot of it is pulled together from the various help documentation about Firemonkey styles. One useful thing I learned from watching it is that you can Double Click a TStyleBook component and it takes you into the Style Editor for the style that is currently loaded in the style book. Head over and watch the full video lesson about working with styles in Firemonkey. And for a bonus if you don’t have the premium styles for Delphi XE5 or Delphi XE6 you can check out our blog post about downloading the Delphi XE5 Firemonkey premium styles and the blog post about the Delphi XE6 Firemonkey premium styles. Delphi XE5 has a dark style and a light style. While Delphi XE6 has three styles which are a dark style, a light style, and a white blueish style. I’m not sure if AppMethod comes with premium styles but the Delphi XE6 premium styles should work with AppMethod as well.